In southwest France, the "eusko" currency has become the centerpiece of an alternative ecosystem that is not obsessed with economic growth. BAYONNE — "The school, the market, the baker, the hairdresser, the tiler, the garage, the restaurant, and, of course, the coffee tours in the Pyrenees…" Dante Edme-Sanjuro no longer thinks about how he'll pay: he settles it all in eusko. Cash or credit card. The Basque country's local currency, which he launched five years ago, has become Europe's first "complementary" currency. Nearly 3,000 people use it daily, including 792 professionals and merchants. Even the mayor of Bayonne has recently integrated it into his system of payment. It is not rare in the roads of the town to see, stuck to the doors or front windows of shops, the green, red, and white sign signifying its use. By the last count, 103,321,382 euskos (each worth one euro) circulate today from pocket to pocket. Its success has "drawn people for the first time to join the transition towards a sustainable economy and re-localization, " says Edme-Sanjurjo. The eusko has become the centerpiece of the alternative ecosystem that has flourished over the past 10 years in this region in southwest France, no longer solely focused on economic growth. 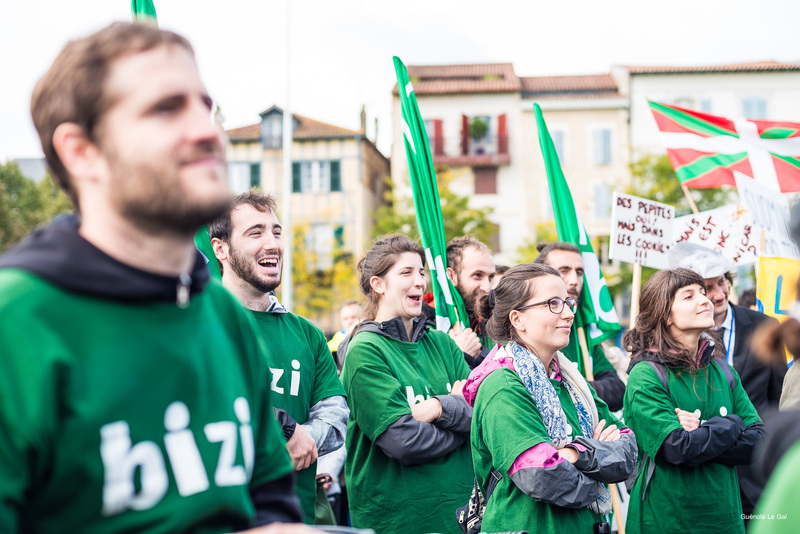 Along with such events as the Alternatiba festival, which since 2013 has drawn thousands of people to Bayonne (nearly 15,000 this year), the use of the alternative currency has spread at the heart of a movement whose name doubles as a rallying cry: "Bizi!" ("living," in Basque), created in the wake of the 2009 United Nations Climate Summit in Copenhagen. Identity and ecology feed off each other. Recognizable by their green t-shirts and their public protests, Bizi! 's activists have made themselves known by "nicking" chairs in local branches of banks accused of facilitating tax evasion, as well as blocking the nearby Pau Summit on Offshore Oil Exploitation in 2016. They're equally pro-active, participating in local institutions, from Laborantza Ganbera, the chamber of alternative agriculture near Saint-Jean-Pied-de-Port, to the renewable energy producer I-Ener, to the Bayonne Workshop for bike repair. Initiatives are designed to encourage dialogue between generations and social classes, as well as rural-urban mixing and inter-regional mixing in general. Borrowing Act Up's concern for efficiency, Bizi! distinguishes itself from other associations by the "quasi-military" rigor of its organization. Facing the scale of climate change, they say, chants and street demonstrations are pointless. "I have children, a job. I can't spend all my time in meetings," explains one activist, David Lannes, a mathematics researcher at CNRS and a specialist in wave motion. "The meetings we do have every 15 days don't last more than two hours. The speeches are timed. The decisions made are stuck to." The association's methods, which mix activism and fundraising, include a "toolbox" for economic transition, adopted by more than 30 town halls in the Basque country. The document lays out 50 concrete proposals concerning urbanism, mobility and public order. The deep-seated attachment to the Basque country, marked by years of fighting for independence, is an essential catalyst. Identity and ecology feed off each other. A fusion fully embodied by Txetx Etcheverry, a 53-year-old trade unionist and Bizi! leader. The Bayonne resident who had fought for years for the political and cultural movement of Basque nationalism (Abatzale) came to the realization that climate change was "the mother of all battles." He says that the current movement has found the right formula to balance social questions and climate issues. "An economic system that needs to grow without limit for its survival cannot remain in a world that does not," Etcheverry explains. "And if we do nothing, it's the poor who'll wind up paying the price."